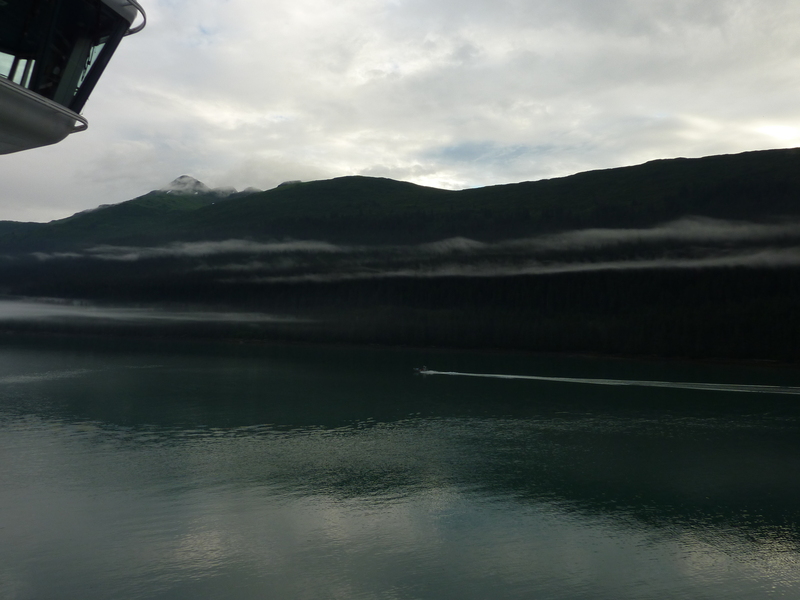 Wednesday, July 24th found us in Juneau, Alaska. Layered fog surrounded the town. We saw our first bald eagles as we came into the harbor. A pair sat on a jetty watching the surface of the water, fishing. The Grand Princess was the third ship in, two others arrived later. 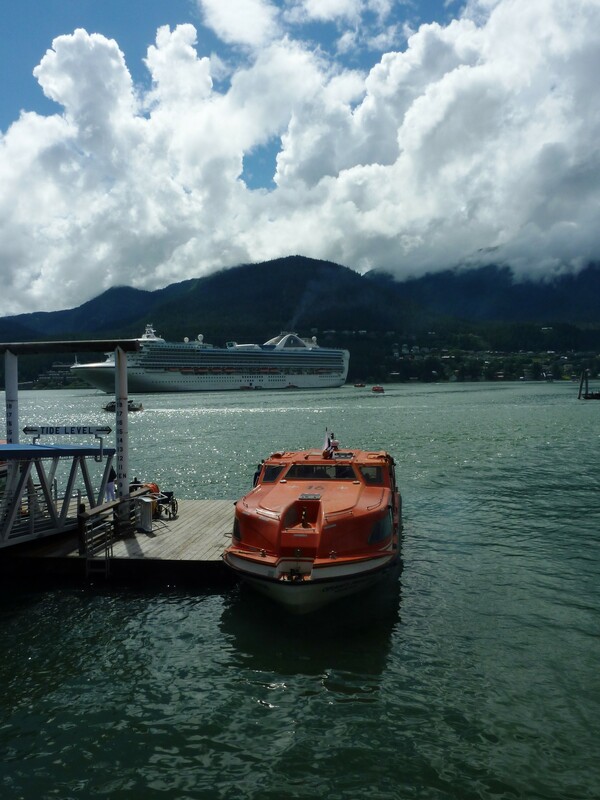 The Princess was too large to tie up at the wharf so we anchored and went ashore by tender. 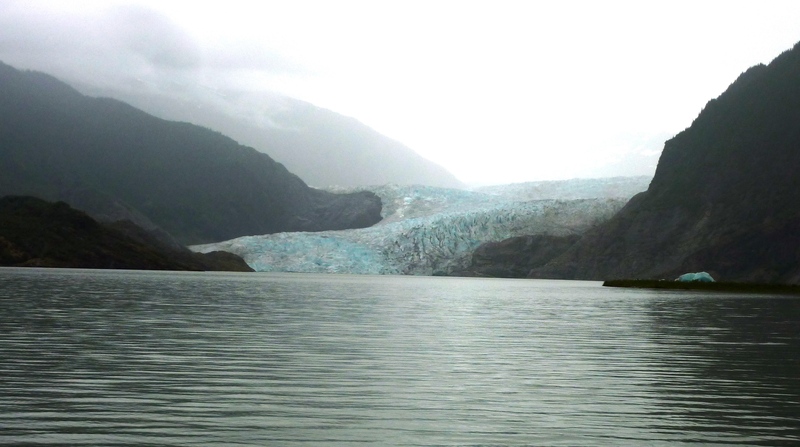 Our goal, visit the Mendenhall Glacier, but not on one of the ships expensive tours. Princess tours run on a time-table that leaves one at the glacier for three hours. We found a local service that ran every half hour. We could spend as much or as little time as we wished. Our driver was a vivacious fifty-something named Mariam. From Iowa she is a part-time teacher and a part-time school bus driver. “We live on my husband’s salary and play on mine. I found this summer job on Craig’s List. I love it here. 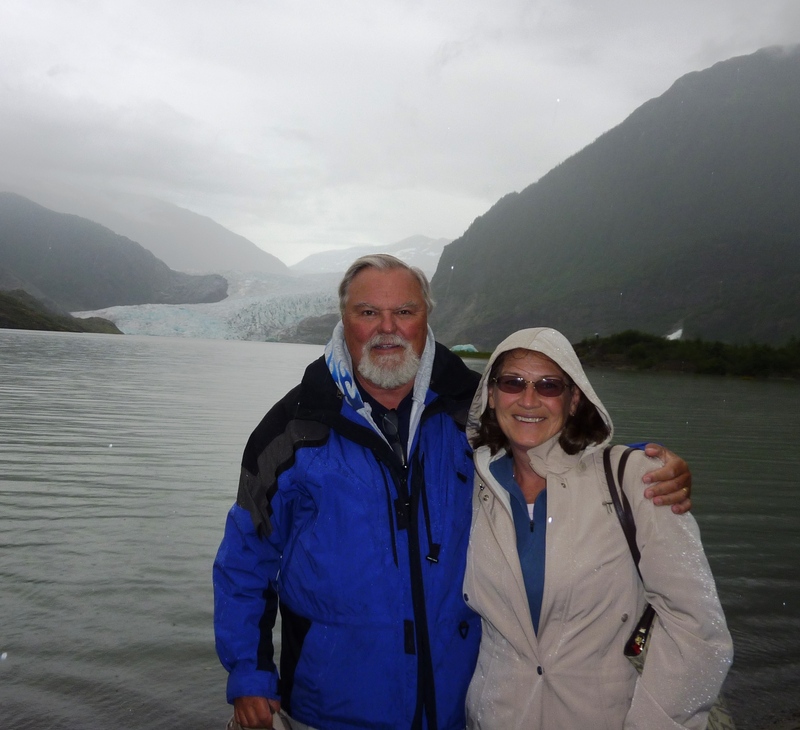 My husband doesn’t so he visits.” Mariam gave us an interesting commentary about Juneau. Her enthusiasm was catching. She got tipped by everyone on the bus. I don’t think the sourpuss who drove us back got a single tip. 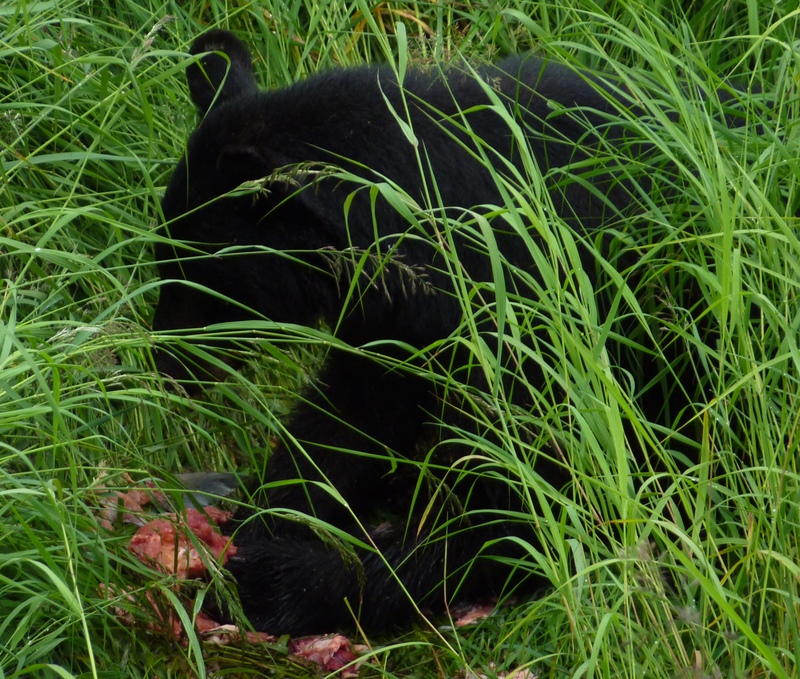 When we got off the bus, we walked out over to the Mendenhall Creek and watched this black bear feasting on a salmon. 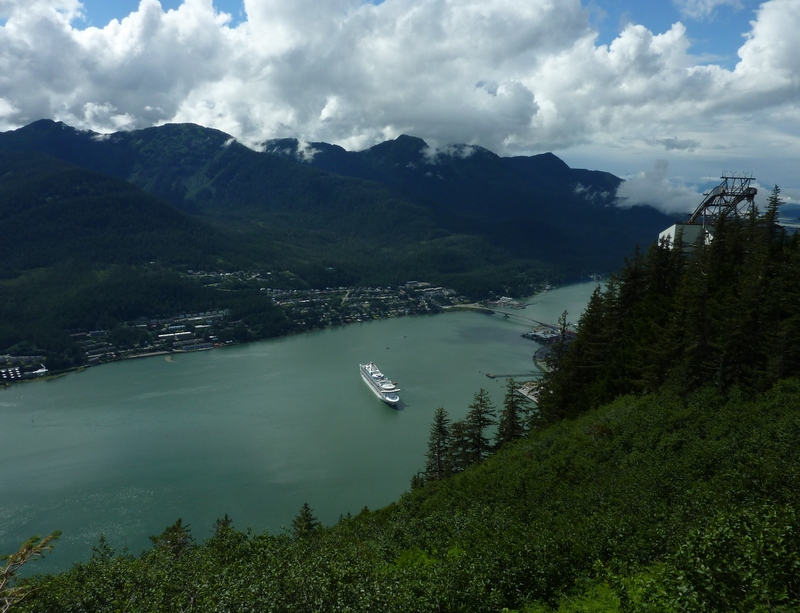 Juneau is landlocked and everything is brought in by plane or ship. The cruise ship crews get a few hours off to do their shopping. At the wharf half a dozen vans marked “Crew Service” sat. For a small fee crew members or anyone else can get a ride to Costco, Wal-Mart, or McDonalds. There are four fast food outlets in Juneau, one McDonalds, and three Subway Sandwich stores. It drizzled most of the time as we wandered about the park. I used my National Parks Senior Pass to get us in for free. When we returned to town, I was ready for a nap. As usual, Cathy was raring to go. I went back onboard. After a bag of popcorn and a diet soda pop I perked up and spent the afternoon reading Green Ice, by I.C. Enger. Cathy took the tram and shot a few pictures. 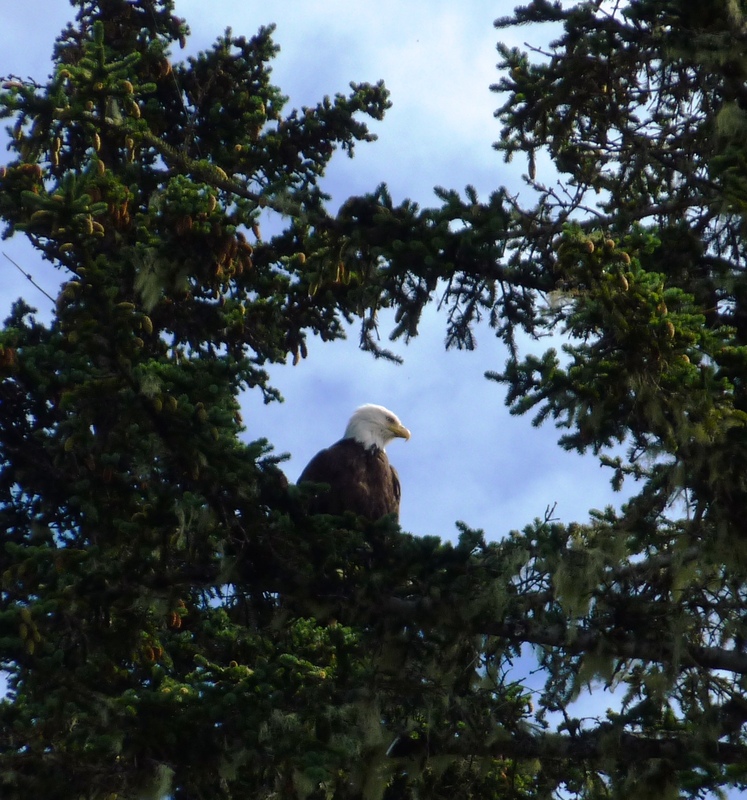 This shot of a Bald Eagle could be a post card. You started with the teaser of seeing a bald eagle and I was saying to myself, where’s the picture? Sure was relieved to see it at the end. And, you were right. It’s postcard perfect.